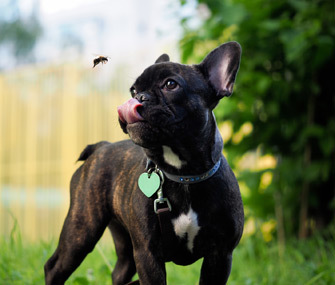 A dog often gets stung on his nose when he snaps at a bee. They say that curiosity killed the cat, but curious dogs don’t fare much better. They become intrigued or aggravated by stinging insects, such as bees, hornets and wasps, and zing! They’ve been stung. Although most of our dogs have a protective covering of fur over their skin, a bee sting hurts them as much as it does us. Besides being painful, it can trigger an allergic reaction that ranges from mild to wild — in a bad way. Here’s how to recognize signs of trouble and relieve the pain if a bee, wasp or hornet stings your pet. Pets, dogs in particular, often get stung on their noses — because they stick them where they shouldn’t go — or in their mouths, after snapping at buzzing bees. So the first sign of trouble may be a swollen muzzle. If you didn’t see your dog get stung but he’s running in circles and crying out, or pawing at his face and rubbing it on the ground, it’s a good bet that’s what happened. Look around for evidence, such as a bee on the ground, bees buzzing around flowers in your yard or a nearby beehive or wasp nest. Canines can experience a variety of reactions to bee stings. In mild cases, you may notice them scratching, rubbing, licking or biting at the area stung. The skin may look red. If you’ve ever been stung yourself, you know that it can cause a burning or itching sensation for several minutes. More serious signs include the aforementioned swelling in the head or neck area, severe pain, hives, vomiting and difficulty breathing. A severe allergic reaction to a sting can result in anaphylactic shock, and it’s an emergency. Some pets may collapse or die if they are extremely sensitive or if they are stung many times. Earlier this year, three dogs in Scottsdale, Arizona, died after being stung multiple times by a swarm of bees.